These figs like to party. Which is good because next week is my 29th birthday. 29! Almost aaaaalmost 30! Not that I’m rushing. Let’s bust out the sprinkles. Or, as my sister’s first grade student calls them, “them sprankles.” To me, nothing says PARTY like rainbow sprankles. Sprinkles. They’re like the tiny party hats of the food world. Only more flattering and without that uncomfortable rubber-band chin strap. Party figs! They’re the best of both worlds. 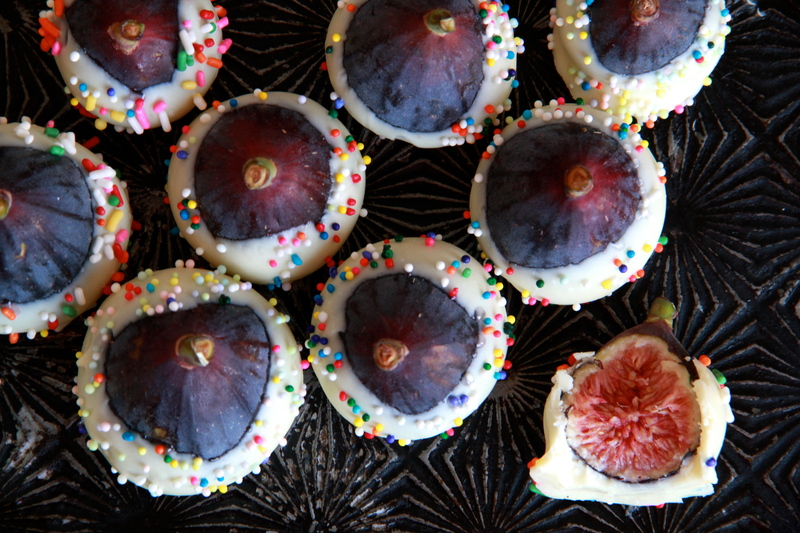 Sophisticated elegance (fresh figs) meets lowbrow nostalgia (white chocolate and rainbow sprinkles). Eating them is like seeing Grace Kelly at the Dairy Queen. Or “The Situation” at Buckingham Palace? Similes aside, I think you’ll want to make these before fresh figs disappear (a.k.a soon). Sweet in both flavor and appearance, they make a playful end to a late-summer dinner gathering, or else just a fun and colorful snack. Either way, it’ll be a p-a-r-t-y. As you’ll see below, I put aside all thoughts of real tempering and decided to go with the cheater’s version of dipping stuff in chocolate. If you can and want to temper your white chocolate so the final product will be stable and snappy at room temperature, by all means, temper away. If you’re feeling like the late months of summer are a BAD time for chocolate tempering and you’d rather use the fridge to your advantage, you’re in good company. 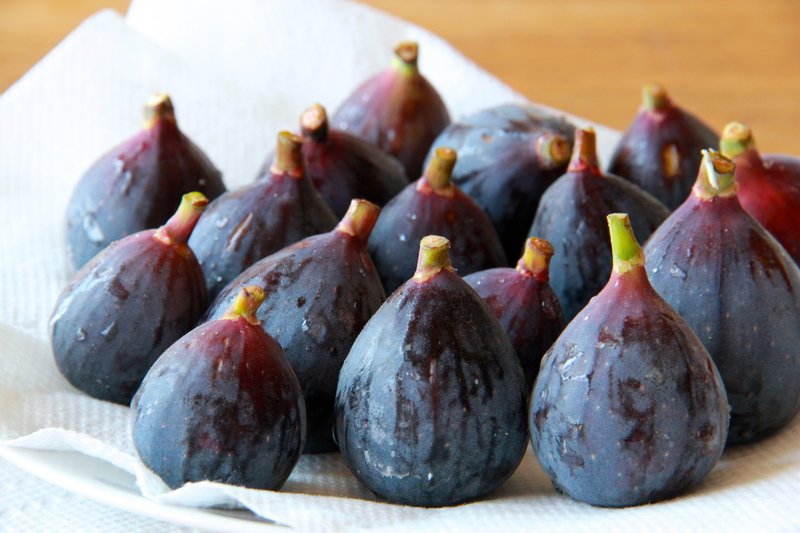 Wash the figs and dry them thoroughly. Set aside. 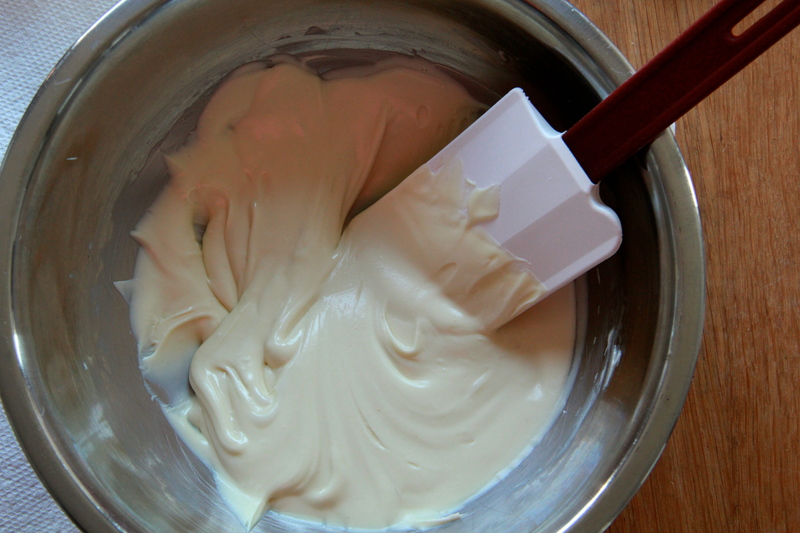 Melt the white chocolate, either in the microwave or in a bowl set over a pot of simmering water (a double boiler, basically). Once the chocolate is fully melted and warm to the touch, stir it up well with a rubber spatula and set it aside to cool slightly. Once it has cooled and no longer feels warm on your lip, give the chocolate a few more good stirs to get it ready for dipping. Holding the figs by their stems, carefully dip each fig into the melted white chocolate, leaving the stems bare. 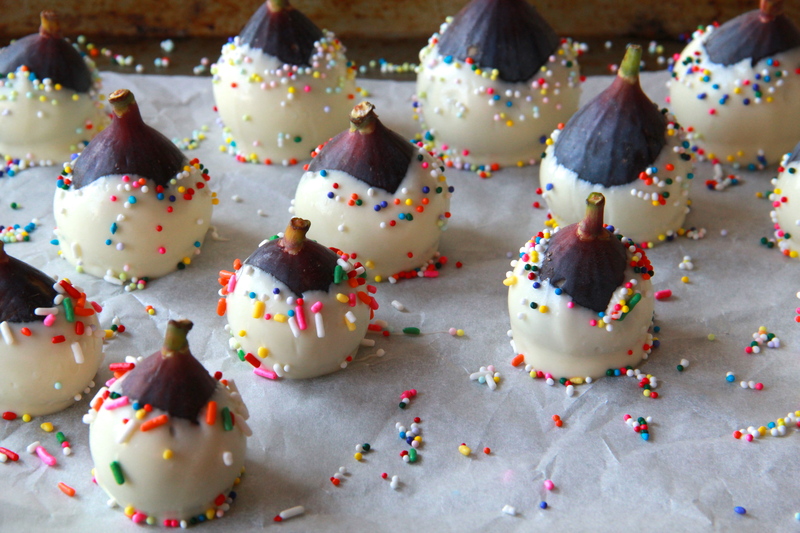 Toss some sprinkles on the dipped figs while the chocolate is still wet, then set each fig down on the parchment sheet. Place the sheet pan in the refrigerator to help the chocolate harden around the figs. Once the chocolate has set up, the figs are ready to enjoy! It’s best to take them out of the refrigerator and let them sit out at room temperature for a few minutes before serving. Makes about 20 party figs. These are adorable and look delish! Happy Birthday! These are great looking. Would dark or light chocolate work too? Probably wouldn’t look as nice….